Things I Learned From My Horse: Run! It has been my experience when riding that it rarely does any good to show a horse something he's afraid of. A horse's natural instinct is to move away from Scary Objects really fast. Making the horse stand still (or worse, approach) and look at something he'd rather run away from is akin to saying, "I swear to God, it'll only hurt a little when the lion takes a bite." I wouldn't believe me either. I'd leave. And trust me, if they want to go there's nothing you can do to stop them. So what's the best thing to do since trying to make the horse walk up to the Scary Object puts you on the Scary Object's staff as the waiter who serves the main course? Stay on the horse's team. Utilizing the horse's comfort zone is a quicker path to restoring calm. Therefore, since two things horses do very well are moving and sticking to a routine, it's a good bet that riding a simple routine he's familiar with and good at will help. Because the routine is familiar he knows what to do, and what is expected. Therefore it's safe. Because he's moving he's cooperating with his ancient fright/flight response. Pretty soon, as he's doing the safe, familiar job, the Scary Object becomes Just Another Object. This tactic works quickly if the rider starts the familiar job at a distance from the Scary Object where the horse shows only a low degree of tension. Then, as the horse relaxes he can be guided closer if necessary. The more stressed the horse becomes, the harder it is to get his attention and restore calm. Also, the more thoroughly trained the horse, the more comfort there will be in his job—and the quicker the Scary Object loses its power. Aren't we like that, too? If the unexpected occurs and we can get right into a well practiced routine we stand a better chance of getting our heads back on straight. People in high risk jobs know this. That's why they train so much. Since stress is part and parcel of our everyday lives, we can adapt this tactic to help us manage what life throws our way. Have you developed any routines that keep your stress level down? Sometimes I'll do the scary thing first and get it out of the way before I go back to my comfort routine. Other times I have to work up to it. You've got guts, Edie! I know there's some folks who thrive on the adrenalin rush. Don't know how they do it! Thank you, Susan, for this perspective. I'm facing some "scaries" over the next week. I need to start thinking like a horse trainer. Good luck with the Scary Objects, Fran! I'll be pulling for you! Ah, geeze, that's one smart horse you have, Susan. Sometimes fear freezes me, and I think what I'm writing is the worst drek known to man. Instead of plowing into it like your horse does, I start sinking and sinking. Getting the words down whether they're imperfect or not is about the best thing you can do instead of letting fear control the situation. Please thank your horse for his wonderful insights! I'm a "freeze in your tracks" kind of gal, myself. Eddie is definitely a "run for your life" horse. I'll pass along your compliment! Sometimes when you see the Scary Object for what it is - an obstacle - it loses it's power. Of course, sometimes a spider in my path can make me rethink my route to my destination! Good advice, to follow the tried and true and let the Scary Object become Just Another Object. I think you do a great job on your blog and passed on a blog award to you. 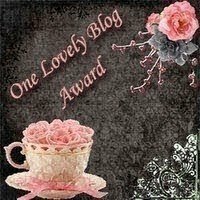 You can visit my post at http://stacyjuba.com/blog/2010/10/14/passing-on-the-one-lovely-blog-award-to-deserving-blogs/ and if you'd like to pass it on to 8-15 deserving blogs, you can follow the format of the post and download the jpeg. Keep up the good work! Stacy, what an honor! I've seen this award on other blogs and wondered what one had to do to get noticed. I still don't know, but I'm thrilled anyway! I will post the names and links to the blogs I pass it to tomorrow. This post makes me appreciate, even more, the people who train the police horses. They have to be able to move into a crowd of people, usually rowdy people! They move as a V-shaped, unit, but still, that's not what horses want to do naturally. When does querying change from a Scary Object to Just Another?? There is quite a lot of specialized training that goes into the making of a police horse. And they develop very trusting relationships with their riders. As for the querying...well, one thing I know for sure: if you stand there and stare at that list it just gets scarier and scarier! Best to do something like...write!